Sight words! We can't get enough sight word practice. If you teach kindergarten, first or second grade, you know how much time you spend teaching sight words and how important they are as they make up the majority of the words we see in books. 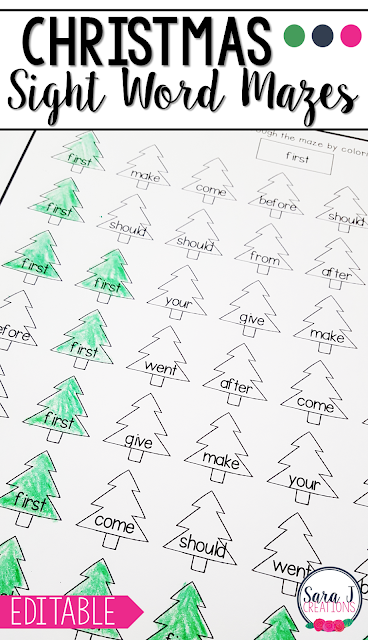 In the fall, I wanted a way that students could practice sight words but it would still be seasonal. I also wanted it to be FUN! I created apple sight word mazes and followed it up with pumpkin sight word mazes a few weeks later. Just a few weeks ago, I added heart sight word mazes to the mix. These are all fun ways for students to practice reading and identifying sight words, but there was a problem. Each set only included 5 different sight words. So even with all three sets you are only practicing 15 sight words. Our students need way more than that to become fluent readers. The other problem with sight words is that we each teach different words at different times in different grades. Some schools use the Dolch lists, some use Fry words and others (like the district I taught in) create their own lists that are a combination of the two. 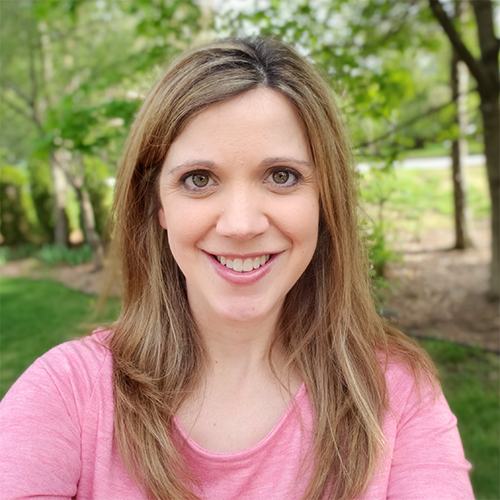 Plus, everyone teaches them in a different order so the words you want your students to practice one month might look very different than a teacher teaching the same grade in a different state. 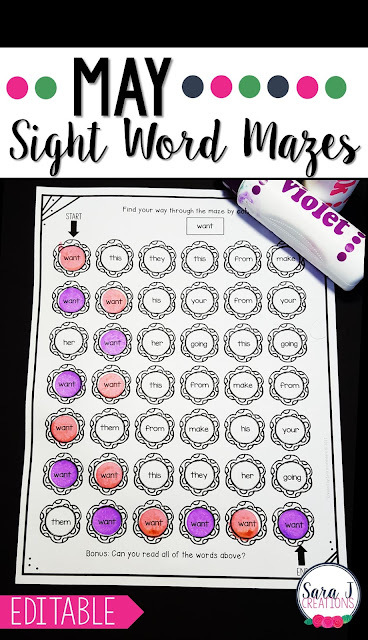 I wanted to find a way to make these sight word mazes work for everyone....and I did just that this week! 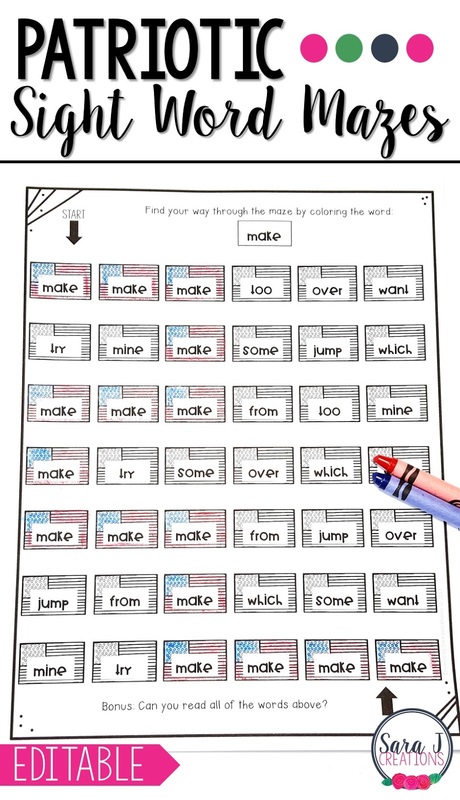 I took those sight word mazes and I made them EDITABLE. 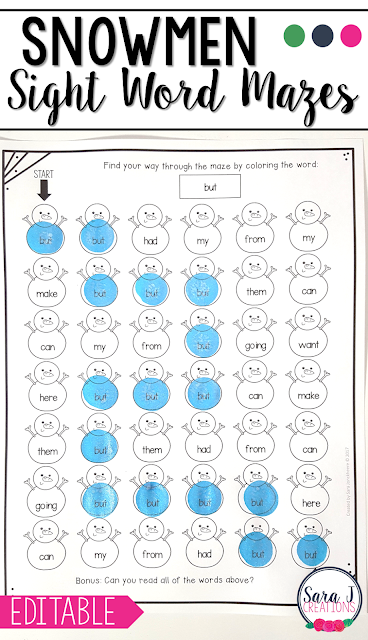 This means that you can add any sight words you want. Basically, students will work through the maze by finding the focus sight word for that page and going from "start" to "end." 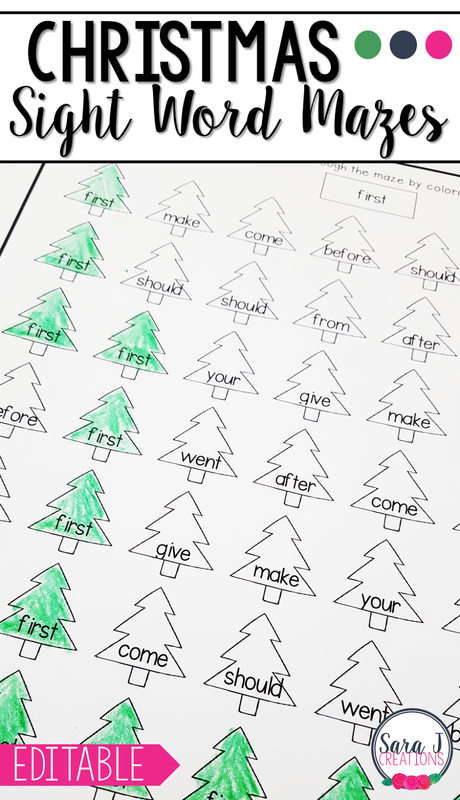 With bingo/dot markers - have students begin where it says "start" and dot the focus sight word for that page. Have them continue dotting the shapes that link to the one they just did and contain the focus sight word for that page. They will need to find shapes that are next to one another that contain the focus sight word for the page. Students could just dot all the shapes with that sight word, but my focus was to get them to go in a line to work through the maze. With crayons - students will need to work through the maze from start to end, but with this method they are coloring the shapes. They will need to color shapes that are next to each other and contain the focus sight word to make it through the maze. Laminate and use counters - if you want to be able to reuse this activity, print and laminate each board. Give students counters (math manipulatives, mini erasers, etc.) and have them work their way through the maze by finding and covering the focus sight word. The possibilities are endless and it can be so much more than a sight word activity. UPDATE: THIS GROWING BUNDLE IS NOW COMPLETE. Because I have plans to make an entire year's worth of mazes, but I didn't want you to have to wait that long to use it, I created a growing bundle of these mazes. As of right now, I have March - February included in the bundle. Each month a new set of mazes will be added until all of the months are added. What's in the bundle now? Here is what is included in the bundle so far. Remember, each month can also be purchased individually. If you don't want the whole bundle or just want to focus on one month, you can buy just the month you want. Just click the links below or the picture for more information. 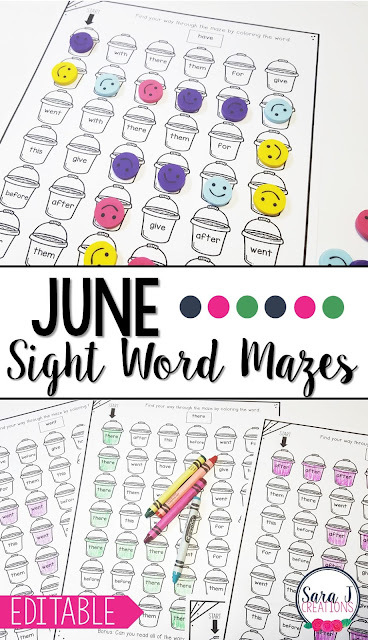 **Plus Bonus Generic Shape Sight Word Mazes (so you can have maze fun no matter what the month or holiday) This is exclusive to the bundle. It CAN NOT be purchased separately. Do I have to pay every time you add another month? No, when you buy a growing bundle it is a one time cost but you get to keep re-downloading every time something new is added. What is the advantage to a growing bundle? When you buy a growing bundle, you are getting a BIG discount on the price of a product because all of the parts of the bundle aren't available yet. The price of the bundle goes up each time another month of mazes is added. How will I know when a new month is added? Unfortunately, TpT does not give us access to email addresses from buyers so I can't just send an email saying it is updated. But there are a few things that you can do. 1. Check back at the end of each month and re-download the file. Files are guaranteed to be in the bundle by the end of the month, if not sooner. The description will be changed and that month will no longer say coming soon. 2. If you go to My Purchases in your dashboard you will see everything you've purchased. There is a drop down menu that says "sort by." Switch that to Recently Updated. It will show which of your purchases have an update available and say Newly Revised Re Download in red letters. Just click to re-download the latest version. If I don't buy now, can I still buy this bundle later? Absolutely! You can buy a growing bundle anytime but the price continues to grow along with the size of the bundle so the sooner you buy it, the more bang for your buck! If I don't want the whole bundle, can I just buy specific months? Yes, for sure! Click on the pictures and links above for the months you are interested it. The only one that will not be available individually is the generic shapes bonus. That will only be available in the bundle. 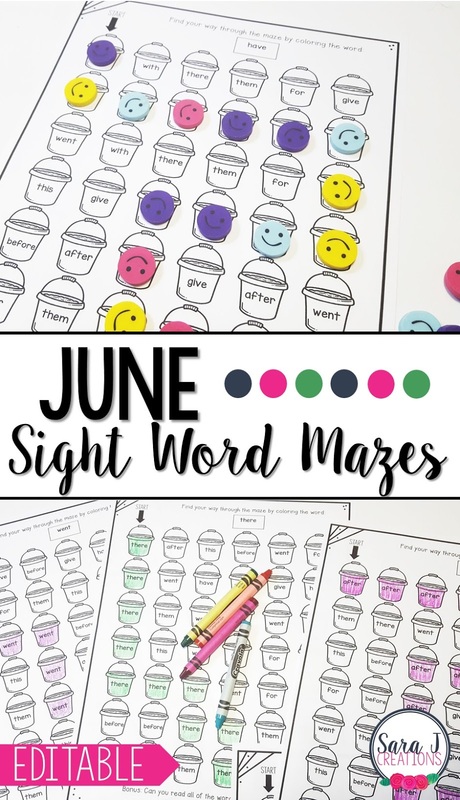 Sight word practice that is fun and useful for everyone, no matter what grade, curriculum requirements or time of the year! That's a win for students everywhere!! 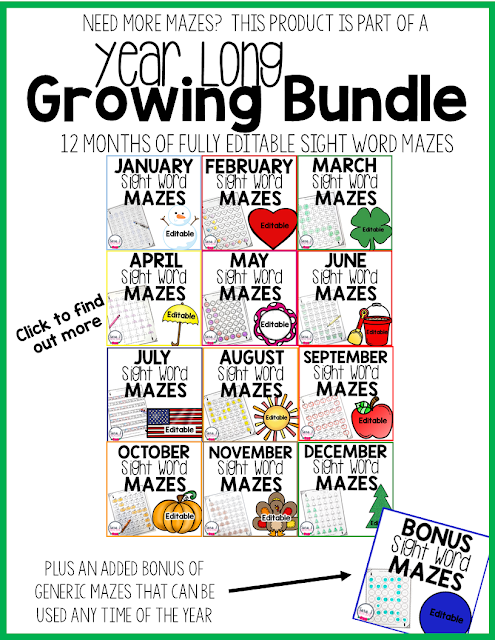 Grab the GROWING bundle NOW on TpT!! Need more sight word ideas? Hi Amy - Yes you can include this in a round up post with one image and a link to this post. Thanks for asking first!